10 days of Engineering and Pre-Job Planning; 52 days of 24hr operations to complete. A major oil company had completed a propane plug and perf fracking operation on an exploratory well. Surface pressures were higher than formation due to the propane frac pressure between plugs and the time required to flowback, To remove the 15k frac head, WR plugs had to be set in the 127mm casing. And once a 10k tubing spool was installed, WR plugs would be pulled and copperhead aluminum plugs milled. Piston was contracted for this job due to the high pressures expected and the complexity of the job scope. 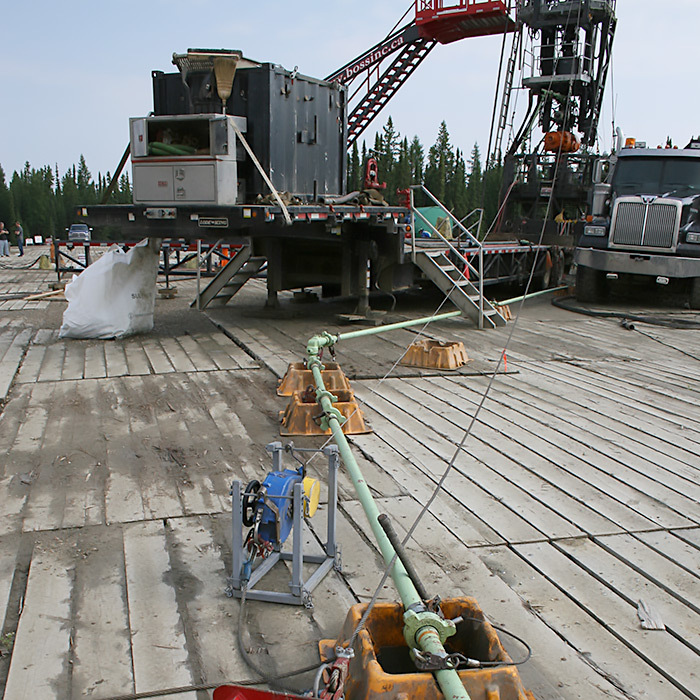 A 285k unit was mobilized and rigged up, a 73mm SLH90 HT drill string was chose to handle the friction issues caused by propane and frac oil in the wellbore. WR retrieving tool was made up as well as jars and dart style floats. The string was RIH to 5 joints from top WR. The wellbore was pressured to 45mpa with N2 and WR plug latched. The plug was equalized and unset after 25 hours of jarring. Surface pressure slowly climbed on the trip out of hole, another WR retrieving tool was made up and the floats were rebuilt. Well pressures climbed to 59mpa. We snubbed 30 joints in the hole, observed flow up the drillpipe, rigged in slickline, set plugs and POOH with drill pipe. Upon examining the BHA, darts in the floats had been pushed through the seats from pressure. We sourced metal on metal BPV’s, snubbed in hole again, latched onto the second WR plug, jarred for 43 hours on the plug until it freed. We pulled out of the hole to find the dies on the WR had cracked and broke off in the well. RIH with mill jars, metal on metal BPV’s, and 73mm drill pipe. Milled through WR dies and aluminum plugs to toe. The life of the stripping BOP fronts was as low as 30 min due to wellbore chemicals. POOH and snubbed in completion string for a very satisfied customer.